The Cuban economy is plagued by widespread distortions stemming from government controls on key variables and the subsequent failure of markets to clear. There are price controls on many goods, including those subject to the rationing system (libreta). And the exchange value of the non-convertible Cuban peso (CUP) is fixed through exchange controls at 1 peso/U.S. dollar in the official market, in sharp contrast with more than 20 pesos/U.S. dollar in the unofficial market. Ownership of U.S. dollars was allowed in 1994 and use of the dollar in special state stores (shopping, known in Cuba as “choping”) was authorized. But prohibition was reinstated in November 2004. Purchases in the shopping stores were still permitted, but only in a special currency called the “convertible Cuban peso” (CUC), fixed at 0.93 per U.S. dollar. Several authors, including Di Bella and Wolfe (2008), Canler (2008) and Orro (2008) have noted that this exchange rate system reduces economic efficiency, has controversial distributional effects, and complicates the measurement and interpretation of key economic variables. Coupled with price controls, this system also hinders the effectiveness of macroeconomic policy, which is the main focus of the present article. Two assumptions will help to keep the analysis tractable. First, Cuba’s rather complicated exchange rate system is simplified by focusing on a fixed nominal exchange rate between the non-convertible Cuban peso (CUP) and the U.S. dollar, ignoring the market for CUCs. As pointed out by Canler, this assumption is fairly inconsequential as long as the CUC is fixed to the U.S. dollar. It also simplifies the analysis considerably, providing a relatively straightforward way to examine economic conditions and policies when markets fail to clear because of controls. Second, the model assumes that price controls apply to all domestic transactions. This is, of course, an extreme assumption: there are markets in Cuba, notably in the agricultural and services sectors, where participants set prices more or less freely (legally or not). However, emphasis on the controlled sector of the economy greatly simplifies the analysis while highlighting the direct effects of price controls. The first section of this paper describes the underlying market-clearing model used as a first step in the analysis. The second section modifies the underlying model by introducing price and exchange rate controls, and examines the behavior of key variables when certain markets fail to clear. The third and fourth sections analyze the effects on the economy of monetary and fiscal policies, with and without rationing. The fifth and sixth sections examine the effects of an increase in foreign remittances; a discrete exchange rate devaluation; and the liberalization of markets for goods and foreign exchange. The conclusion argues for full price and exchange rate decontrol coupled with fiscal transfers to protect the poor from the impact of price increases. The Annex presents a summary of the models discussed in the first two sections. Most importantly, this model recognizes that there is no domestic bond market in Cuba, and that Cubans are generally not allowed to trade freely in foreign securities. Therefore, the original Mundell-Fleming assumption of equality between domestic and world interest rates, which implies perfect capital mobility, is untenable. Nevertheless, the government—and, at times, certain enterprises—are authorized to borrow from foreign banks or suppliers. Information on such credits is scant, but it will be assumed that the cost of borrowing is equal to the world interest rate plus a Cuba-specific risk premium related to the size of external borrowing. The implication of these assumptions is that domestic cit conditions in Cuba may be affected, albeit certainly not determined, by world interest rates. Other capital inflows, including direct investment and bilateral assistance from “friendly” countries—Venezuela now, the Soviet Union in earlier days—are basically exogenous. In Figure 1, panel a, equilibrium is represented in exchange- rate/output space by the intersection of the IS* and LM* schedules.3 The IS* line shows the combinations of income and real exchange rate that are consistent with the equality of total saving and investment (or equivalently, between domestic production and expenditure). Starting from any point on the IS* line, an appreciation of the real exchange rate increases net imports (and therefore lowers domestic expenditure), which requires a reduction in income to restore equilibrium. The IS* schedule is therefore downward sloping. The LM* curve is upward sloping because the supply of real money balances is assumed to depend not only on the domestic producer price but also on the price of imported goods and therefore on the exchange rate. Thus, a depreciation of the peso which increases consumer prices will lower the real supply of money, and this will require a fall in income to bring down the demand for money and restore equilibrium. The demand for money is assumed to be interest- inelastic—probably a realistic assumption since there are very few interest bearing substitutes to money in Cuba. In panel b, the aggregate demand curve represents the IS*-LM* equilibrium in price/output space. Together with the aggregate supply curve—that combines equilibrium in the labor market with the economy’s production technology—the aggregate demand schedule determines the level of output and the price charged by domestic producers. Panel c represents the balance of payments. The current account deficit, defined as net imports of goods and services minus remittances from abroad, is positively related to the value of the peso since an appreciation of the exchange rate erodes the competitiveness of net exports; therefore the D schedule is upward sloping . In the absence of central bank intervention, the current account deficit must be equal to the exogenous net inflow of foreign capital KI (at point d0). The position of KI on the horizontal axis is determined by the cost of borrowing abroad and by exogenous events. 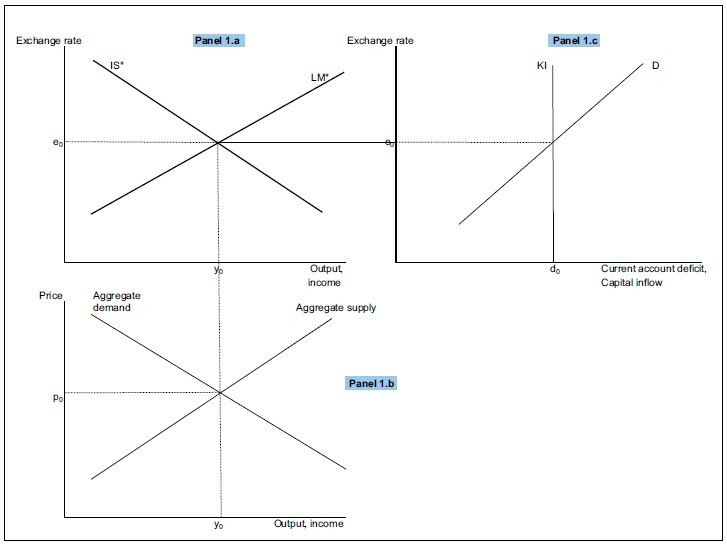 In Figure 1, the model determines market-clearing equilibrium levels of income (y0), the domestic producer price (p0), the current account deficit (d0), and the real exchange rate (e0). 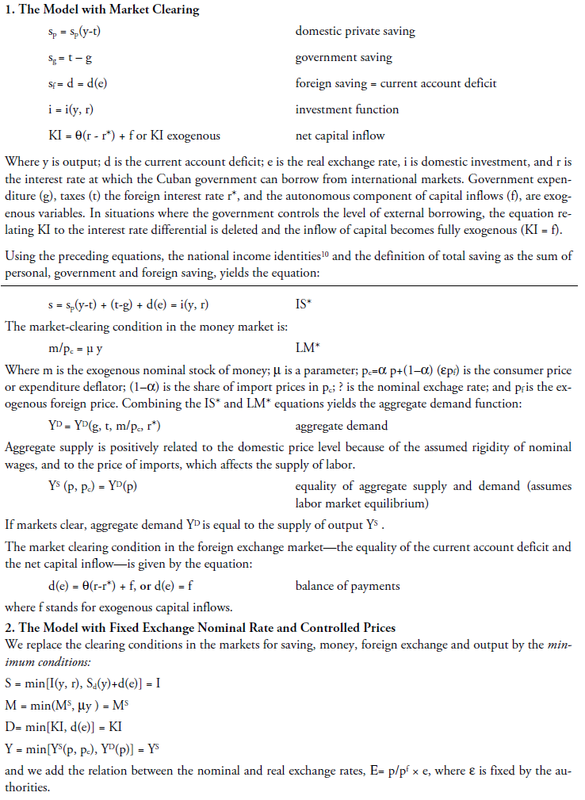 In this version of the model both prices and the exchange rate are free to move in order to equate demand and supply. In sum, the underlying model solution represents the working of a small, relatively free market economy where domestic and foreign assets are imperfect substitutes. The next step in coming closer to a description of the Cuban economy is to transform the model by incorporating government controls and rationing mechanisms. We consider two major sources of distortion: price controls coupled with various rationing mechanism (including the libreta for basic consumer goods); and a fixed value of the peso supported by exchange controls. Figure 2 shows how these actions prevent markets from clearing and affect the values of key variables in the model. 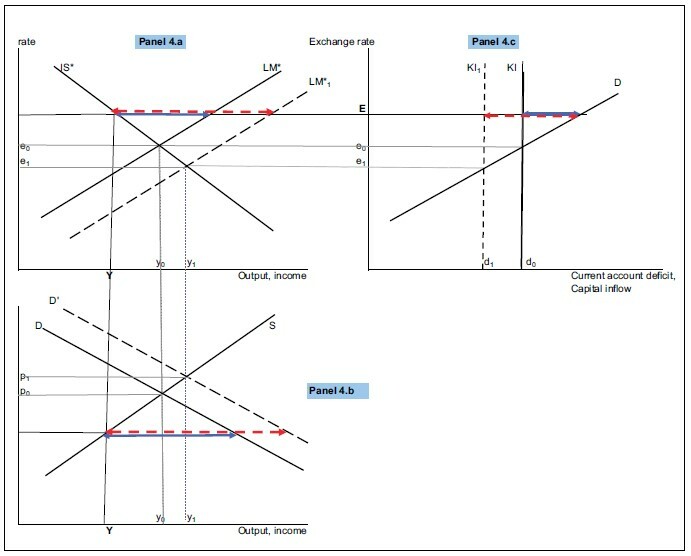 Figure 2, panel c shows that, at the appreciated exchange rate E, the current account deficit exceeds the net capital inflow, as indicated by the horizontal double arrow. In that situation, the authorities have three alternatives. They can accommodate the demand for net imports in full by selling some of their foreign exchange reserves to importers. This would shift the net capital inflow schedule to the right and allow the external deficit to widen (to d1). 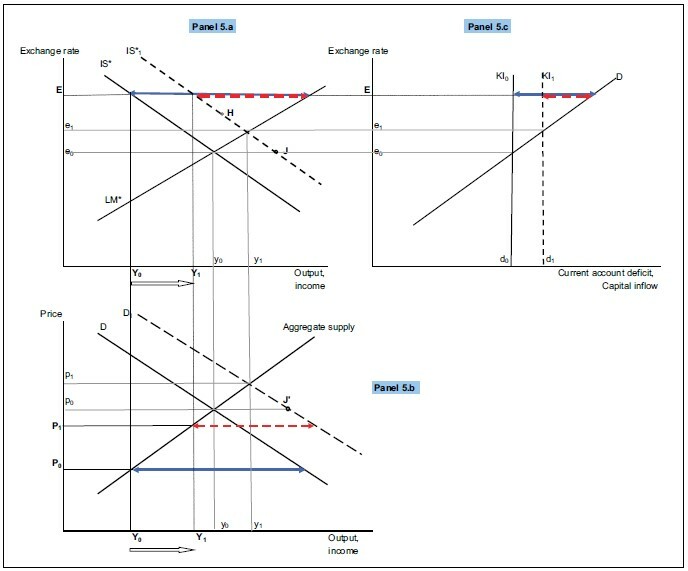 It would also reduce the money supply and shift both the LM* curve (panel a) and the aggregate demand curve (panel b), to the left. Of course, this could go on only as long as official reserves last, and it is therefore unsustainable. They can authorize new external borrowing by the public sector, which again would shift the KI schedule to the right and sustain a larger current account deficit. To sum up, Figure 2 shows that controlling prices at below-market levels constrains output, leads to an appreciation of the real exchange rate and, unless additional foreign borrowing is made available to the rationing of foreign exchange. This will be the case even if the value of the peso is not fixed. This Illustrates an important aspect of markets that fail to clear: distortions in one market will have consequences for other markets. Start from the market clearing equilibrium e0, y0 , p0 and suppose the authorities decide to fix the nominal exchange rate ε at the appreciated level ε.7 This will put upward pressure on the real exchange rate (toward E) and downward pressure on the price level (from p0 to P) and on output (from y0 to Y). In sum, fixing the nominal exchange rate at an overvalued level causes a real appreciation of the peso, increases the demand for imports, lowers national income, and generates excess demand for goods and services even if prices are not controlled. Again, controls in one market will have consequence for other markets. Suppose now that the fixed nominal exchange rate coexists with price controls. 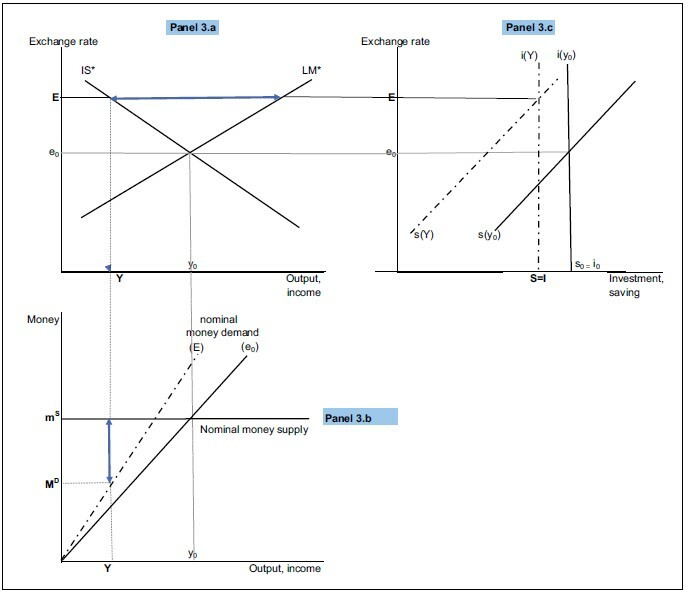 By construction, the constrained level of output consistent with the fixed nominal exchange rate ε and with the equality of output and expenditure in Figure 2a is the same as the one determined by the aggregate supply schedule at the fixed price level P in Figure 2b (namely Y). If the authorities were to fix the nominal exchange rate at a less appreciated level, output in Figure1a would, ex ante, exceed its level in Figure 2b. Correspondingly, the price level would be above the controlled level P. However, this scenario cannot materialize if the authorities stick with price controls: the price level will have to remain at P while income and the real exchange rate remain at Y and E, respectively. A different perspective on the quantity-constrained model is provided in Figure 3, where panel a reproduces the IS*-LM* diagram of Figure 2. Panel b now shows the demand for money (a function of income and the expenditure deflator pc) and the exogenous supply of money ms, with market-clearing equilibrium at income level y0. If income is constrained at Y as a result of controls, the demand for money will fall to MD and there will be an excess supply of money (overhang) equal to the vertical distance mSMD. Figure 3c displays the schedules for total saving and investment, with market-clearing equilibrium at e0 and s0=i0. Total saving is the sum of domestic and foreign saving, and the latter is identical to the current account deficit which tends to widen when the exchange rate appreciates. Therefore the total saving schedule is upward sloping. If the exchange rate is fixed at E, the equality between saving and investment (which is required for any point on the IS* curve) will involve an excess supply of saving over investment that corresponds to the monetary overhang. We now turn to the effects of macroeconomic policies. Consider first an increase in the nominal supply of money by the central bank that shifts the LM* curve to the south-east and the aggregate demand curve to the north-east (Figure 4). When markets clear, the result is a rise in income (from y0 to y1), upward pressure on prices (from p0 to p1), a real depreciation of the peso (from e0 to e1), and a narrowing of the current account deficit (from d0 to d1). 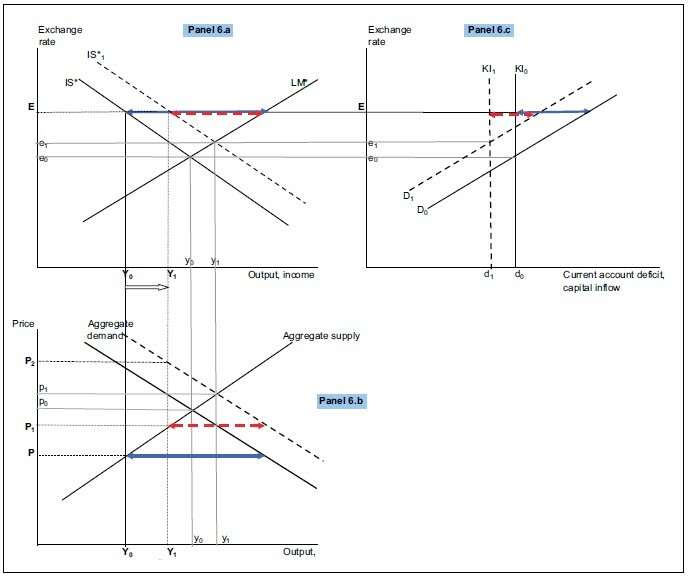 With a fixed nominal exchange rate and price controls the monetary expansion has no effect on incomes or prices; all it does is to increase the unsatisfied demand for goods and foreign exchange and the monetary overhang, as indicated by comparing the (solid) and the (dotted) double arrows. Because the model (and the Cuban economy) do not allow for domestic bond financing of deficits, we consider two alternative forms of fiscal expansion: (i) a rise in spending financed by foreign borrowing; and (ii) a rise in spending financed by monetary expansion. In both cases, the fiscal expansion translates into a shift in the IS* and aggregate demand curves to the north-east, as shown in Figure 5. Under market-clearing conditions, this action will raise output from y0 to y1, and domestic prices from p0 to p1. Since the government is assumed to borrow from abroad to finance its emerging deficit, the capital inflow schedule KI will shift to the right in panel c and intersect the current account deficit schedule D at point e1d1, to the right of the initial equilibrium.9 The peso appreciates from e0 to e1, inducing a widening of the current account deficit from d0 to d1. If prices are fixed at P0, the initial quantity constrained equilibrium involves income at Yo. As in the market clearing case, the increase in government expenditure shifts the IS* and aggregate demand curves to the north-east, which ex ante raises income and prices (to Y1 and P1, respectively). This absorbs some of the excess demand for output (as indicated by the dotted double arrows) and reduces the monetary overhang. Government borrowing to finance the emerging deficit shifts the capital inflow schedule to the right (panel c), narrowing the gap between the official rate and the parallel market rate and reducing the need for foreign exchange rationing. However, if price controls remain, actual prices will have to remain at Po, ensuring that output remains at Yo. In the end, the only effect of fiscal expansion financed from abroad will be a higher external debt and a larger current account deficit. This method of deficit financing, involves a shift to the right in the LM* and aggregate demand schedules, in addition to the upward shift in the IS* curve. If markets clear (with equilibrium at points J and J’ in Figure 5), the ex ante rise in output and prices will be larger than in the case where the fiscal deficit is financed by foreign borrowing. If, however, markets fail to clear because of exchange rate and price controls, the effect of fiscal expansion on output and prices will be negated. Moreover, the imbalances in the goods, money and foreign exchange markets will be larger than if the deficit were financing through foreign borrowing. Inflows of remittances from abroad reflect largely the decisions of Cubans residing outside the country. However, the associated use of U.S. dollars in domestic transactions has been affected at various times by Cuban government decisions, including legalization in 1993, re-prohibition in 2003, and taxation via forced conversion of dollars into CUCs. These decisions influence how an inflow of remittances will affect the economy. Remittances from abroad appear as a positive item in the definitions of both the current account of the balance of payments and national income. Therefore an increase in remittances shifts the IS* schedule to the right (Figure 6a) and the current account deficit schedule D to the left (Figure 6c). Moreover, the immediate counterpart of current account transfers in the balance of payments is an increase in Cuban residents’ net claims on foreigners as the recipients of remittances acquire U.S. dollar currency or bank deposits abroad. Therefore, the net capital inflow schedule in panel c shifts to the left. If markets were allowed to clear, the peso would appreciate from e0 to e1 and national income would rise from y0 to y1. The current account position would improve from d0 to d1—by less than the increase in remittances because net exports of goods and services would be crowded out by the appreciation of the peso. Even with price controls and a single, fixed exchange rate, income also rises (from Y0 to Y1) as a result of the increase in remittances, on the critical assumption that they are spent in shopping stores on goods that are not subject to price controls. If dollar remittances can be converted into Cuban pesos (CUPs) at the free market exchange rate e1, the excess demand for dollars will be further reduced. Goods in the amount of Y0 will continue to be supplied by domestic producers at the controlled price P0, and an amount Y1–Y0 will be sold in shopping stores at the higher price P2. Returning to Figure 2, a once-and-for-all devaluation of the peso (CUP) against the dollar would show up in panel a as a parallel downward shift (and a reduction in the length of) the double arrow, with a new exchange rate somewhere between E and e0. Ex ante the result would be to increase income and prices, and to lessen the need to ration goods and foreign exchange. If, however, the authorities insist on keeping price controls unchanged the increase in output will not materialize, again illustrating the pervasive impact of price controls as well as some of the difficulties of partial liberalization. National income would rise and so would total employment; government revenue would expand, reducing the budget deficit while making room for more generous social safety net transfers. The rationing system would come to an end as domestic prices moved up to their marketclearing levels, eliminating the welfare losses associated with queues other forms of non-price rationing. Assuming no central bank intervention in the foreign exchange market, the peso would depreciate, stimulating exports and making exchange controls obsolete. This paper shows that the combination of exchange rate, price and foreign exchange controls practiced in Cuba lowers output, employment, and exports and hinders the efficacy of macroeconomic policies. (The key policy effects are summarized in Table 1.) In particular, under rationing conditions, expansionary monetary and fiscal policies lose their ability to influence income and prices, and serve only to boost the monetary overhang and increase the severity of exchange control. Full exchange rate and price liberalization would increase national income and eliminate rationing in all markets, thus ending the shortages, queues and power failures that have made the lives of Cubans so difficult for so long. At the same time it will end the corruption and political arbitrariness inevitably associated with government controls, and the discrimination against exports resulting from an overvalued exchange rate. There is only one objection to full liberalization that deserves consideration: that the increases in both domestic and import prices resulting from decontrol and the depreciation of the peso would create an untenable situation for the poor. But there is a way out of this, which is to couple liberalization with a rise in fiscal transfers to the poor and possibly a one-time increase in public sector salaries to protect low income state employees. Contrary to what is sometimes asserted on both sides of the Florida straits, this can be done without endangering the fiscal position (even in the absence of foreign aid) in part by eliminating the subsidies associated with price controls and other unnecessary government outlays, and because of the increase in fiscal revenue expected to result from liberalization. In conclusion, the policy of full price and exchange rate liberalization coupled with a reinforcement of the social safety net is a winning combination. There is, in fact, no reason not to adopt it—other than the fear that it might give Cubans too much freedom. 1. I am indebted to Luis Locay for his comments on a previous version of the paper. 2. For a somewhat more complex version of the Mundell-Fleming model, similar in some respects to the underlying model presented here, see Mankiw (1992), Appendix to chapter 12. 3. The stars are used to differentiate the IS and LM lines from those used in the conventional, closed economy version of the model, where the vertical axis typically measures the interest rate rather than the exchange rate. Throughout this paper, the exchange rate is defined so that a higher value involves an appreciation of the Cuban peso. 4. In general lower case letters refer to market-clearing values and capital letters to quantity-constrained values associated with controls. It should be noted that this paper deals essentially with the absolute price level and not with relative prices. 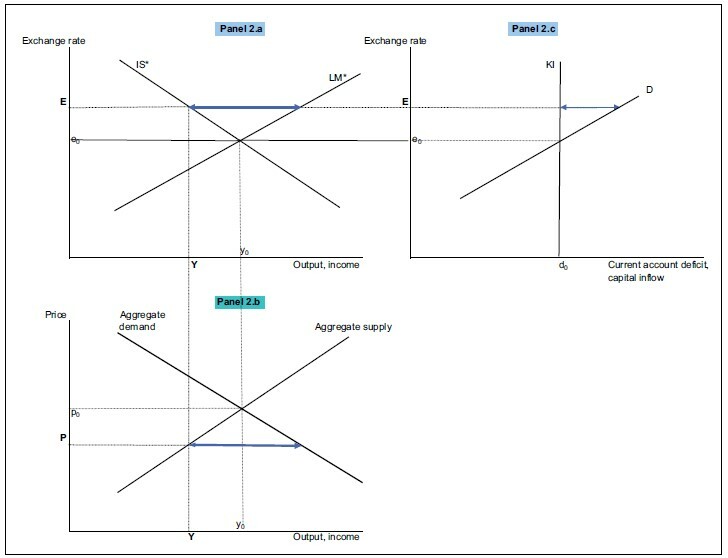 To give a concrete example, in the demand/supply diagram in Figure 2b the controlled price level P can be interpreted as the ceiling applicable to the output price of a typical firm. But the model does not consider the possibility that the price of inputs may also be set above or below its market equilibrium level. Luis Locay has pointed out to me that the efficiency implications of relative price distortions in the Cuban economy may well be more severe than that of absolute price distortions. 5. Of course, they can keep producing as long as they are subsidized by the government, as happened in the 1980’s when the Soviet Union was willing to pay for the subsidies. After the collapse of Soviet aid in 1989–90, the Cuban government initially provided huge budgetary subsidies to offset the losses of state enterprises, with the resulting fiscal deficits being financed largely by monetary expansion. But this could not last: in 1994 budget subsidies were slashed as part of a far-reaching stabilization plan. 6. This is an example of the minimum principle, according to which the market clearing condition x = xD =xS is replaced by the condition x = min(xD, xS), where xD and xS denote the demand and the supply for variable x, respectively. 7. The exchange rate that is fixed by the authorities is the nominal exchange rate (ε) while the one that influences the IS* and LM* schedules in Fig. 1a is the real exchange rate (e). For convenience, units of measurement are chosen so that, in equilibrium, the nominal and real exchange rates are equal (ε0 = e0). 9. This is not quite the end of the story, however. The increase in prices reduces the real money supply and the LM* curve shifts to the left, intersecting the new IS* curve at a point such as H. This shift has no qualitative effect on the key variables of the model. 10. The equality between total expenditure and total income implies c+i+g-d = c+sd+t which, after some manipulation, implies equality between total saving and investment, i=sd+sg+sf.